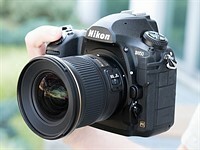 Among the features introduced in Nikon's new D5 and D500 DSLRs, we're very excited by automated AF Fine Tune. This feature allows users to quickly fine-tune their specific camera bodies and lenses, maximising the chances of a sharp shot and avoiding the lengthy process of trial-and-error tuning that was previously necessary. Watch our video and read our in-depth analysis. If you're a DSLR shooter, you may be acutely aware of consistent front or back-focus issues with some of your lenses, particularly fast ones like F1.4 primes. Mirrorless users tend to not have such issues, because their cameras focus using their image sensors. When a mirrorless camera says it's achieved focus, generally it's actually in focus. That doesn't necessarily hold true with DSLRs, which use a secondary phase-detect sensor under the mirror as a sort of proxy for focus at the imaging plane. This makes DSLR focus sensitive to misalignments between the secondary AF module and the image sensor, and also requires calibration of the optics inside the module itself. Furthermore, the way these phase-detect AF modules work makes them sensitive to certain lens aberrations, like spherical aberration. Manufacturers of DSLR bodies and lenses do a lot of calibrations to make sure that this isn’t an issue, calibrating every AF point at the factory, writing look-up tables into lenses, and more. But the reality of tolerances is such that you’ll be best off if you calibrate your particular copy of a lens and your particular copy of a body yourself. That’s what AF Fine Tune, or AF micro-adjustment as Canon calls it, is all about. Nikon's new automated AF Fine Tune makes things as easy as child's play. It uses contrast-detect AF in live view, which focuses using the image sensor and is nearly always accurate, to calibrate its own phase-detect AF system. Watch our video above to get an idea of just how easy it is to calibrate your lenses on the new D5 and D500 cameras. A couple of things are worth keeping in mind. For some lenses and systems, the optimal calibration value can change for different subject distances. This isn't necessarily always the case, but you may wish to calibrate for the subject distances you're most likely to shoot for any particular lens. For a good all-round calibration, we're told that using a target approximately 40x the focal length away strikes a good balance. The key here is to play around a bit. Try a couple different distances, a few different runs, and make sure you're getting a consistent result. Sometimes we've found the optimal value to change with lighting temperature, but this sort of thing is precisely why the automated procedure is so valuable: if you're running into trouble with focus, you can - right at the wedding reception you're shooting - set the camera on a table, point it at a static object, and calibrate your camera in under 10 seconds. Yeah, we timed ourselves. Here's an example of how Fine Tune helped calibrate our Nikon 24/1.8 to our D5. Roll your mouse over the 'OFF' and 'ON' buttons to see Sam's eye sharpen up. 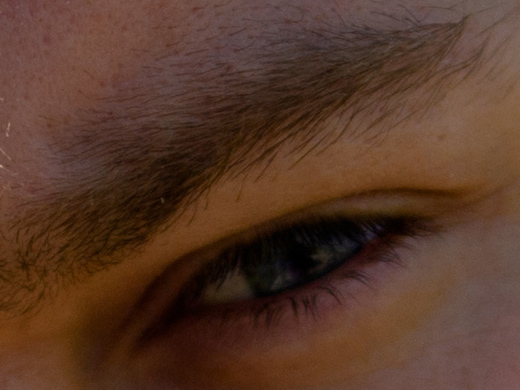 If you click on the main image, you can see the full image in a separate window, where you'll notice that the 'OFF' shot is front-focused on Sam's nose, while the 'ON' shot is focused correctly on his eye. We placed a single AF point over Sam's left eye (on camera right) for focus in both cases. In this case, for this lens paired to this body, automated AF Fine Tune found a value of +14 was best. This indicates that for correct focus, the camera has to shift focus backward an arbitrary 14 units from the focus reading the phase-detect sensor makes. In other words, out of the box, this lens on our D5 front-focuses. If it had back-focused out-of-the-box by a similar amount, we might have expected the automated procedure to find -14 to be the optimal value. AF Fine Tune currently only writes one global value per lens. This means the calibration value can't be adjusted for either end of a zoom. Furthermore, only the center point can be calibrated - the camera assumes that the calibration at the factory ensures all points are consistent with one another and, importantly, the center point. Finally, as mentioned earlier, sometimes the optimal value can change based on subject distance. Canon cameras currently at least offer to microadjustment values for either end of a zoom, but don't offer any sort of automation to help you out. Sigma and Tamron USB docks allow for calibration at either end of the zoom, and for 3 to 4 different subject distance ranges, allowing for a high degree of accuracy of calibration. Unfortunately, entering 4 different subject distance ranges for two ends of a zoom mean the user has to literally set up the camera 8 times, with some sort of test target for accurate assessment - hardly practical for most working photographers. The key here is automation: automating opens up a world of opportunities, and automated Fine Tune is an important first step. We'd even imagine a future implementation where calibration data for all focus points is stored and learned from over time. Every time you calibrate a particular point, the camera could retain subject distance information (passed on to it via the lens), and over time learn the best calibration values for each point, for all subject distances, for different temperatures and lighting as well (the latter are often minor concerns). Nikon's automated AF Fine Tune is truly one of the most welcome features we've seen added to a DSLR in recent times. We've wondered for years why camera companies don't use their contrast-detect AF to self-calibrate their phase-detect systems, instead relegating calibration to a cumbersome end-user experience. Automated Fine Tune changes all that. It’s a really useful feature that takes a lot of guesswork and cumbersome aspects of calibrating yourself out of the equation, allowing you to do it on the spot, at an event, anywhere, on the fly. In fact, anyone working with shallow depth-of-field imagery should absolutely perform this procedure. Wedding, newborn, portrait, lifestyle, photojournalist, and even sports photographers: take note. * We really like Reikan FoCal for research purposes though: you get a plethora of data for how a body/lens combination behaves at different subject distances, on different days, under different lighting, and even a map of the optimal calibration value per AF point. Of course, since you can only enter one global adjustment value into your camera, this information is a bit more academic, but if you want to get an idea of the behavior of your system, there's probably no more comprehensive tool than FoCal. Will manual focus serve as a stopgap? Sorry, duplicate. Either delete this or the previous post. Is there information on what these numbers +5, -5 and so on mean in terms of centimeters/meters in front or backfocus? So if I have a 70mm lens that is +13 and the subject is 30 meters away, how big is the front focus expected to be? Are there tables for this? I just got the D5 back from service. It had a front focus, so it is now set to +2. The 24-70 (new version) had a front focus that has to be corrected by +13 for 24mm, a front focus +28 for 50mm and is correct for 70mm. The lens was sent to the next bigger Nikon lab to fix it (since new gear is needed for this). In order to understand the result I had during shooting (complex light during live performance) I would like to see some table of what these mis-focussings mean in terms of meters, centimeters, ... So, a +28 for the 50mm +2 for the camera could mean that I am 2m off at a 20m distance and 1m off at 4m distance. Are there tables like this? Well it's nice that they're finally trying, but for me it's far too little far too late Even with this sort of system, you might fix focus at close distance and wide open aperture, but then you shoot at a longer distance or different aperture, or with a different focus point and all of your adjustments might have even made things worse. I gave up on DSLR autofocus and moved to mirrorless and couldn't be happier. Focus is done by the actual sensor so more accurate focus is an inherent benefit over separate AF modules, and you can ever focus wherever in the frame you want to! The better systems will even find and highlight your subject's eye so you can get back to taking great photos instead of frustrating yourself waving the camera around like an idiot to get your subject under an AF point and still end up with an out-of-focus shot. On-sensor focus' only current weakness is AF speed where legacy AF modules still have an advantage, but even that gap is shrinking. Well, it's about time they got started on this. Let's hope they provide firmware updates with improvements to this system. Now Canon, smell those Nikon roasted coffee beans? Get going you lazy Canon bums! This feature should be included on every DSLR from the high to the entry level too! So here's what I've always wondered - you the photographer are never truly still. They the subject are never truly still. Given that, is it really more than luck in many cases? Yes, I've had cameras/lenses with horrible back focus so the extremes certainly matter, but once you are within a tolerance? Do you mean is accurate focus anything more than luck? If you use S-AF there is some grey area there. If you use C-AF it's a different story. Sorry for the delayed response. Yes, with S-AF that was my potential hypothesis. As soon as it locks subject and photographer (can) start to shift. I wonder what percentage of shots that impacts. Certainly as I get older I get less steady. Im sorry but I disagree. Canon with 1Dx will do better job with top quality Canon L series lens. Or get 7D MKII and do that way. I have heard someone bought 80D and 150-400mm, it works so well with AF, always no problem even with OVF. Sony 6300 has issue problem with bandwidth writing to memory and etc while black out in EVF. OVF is still needed for sports shooting. And while Nikon still beats Sony in terms of Dynamic Range and High ISO and based ISO noise. Long EVF blackout is causing by delay of buffer which is slow buffer. It is not good. It is very annoying to photography who simply want to finish taking continuous shooting without interruption. Actually, no he is still wrong. D5 stinks, D500 for apsc is good, but A7RMK2 is god-like. Depends on the camera but his blanket statement is wrong. D5 is only target for high ISO sports shooting btw and useful for high ISO astrophotography as well. The camera with different output of noise profile is important. The more sensitive at low ISO for landscape will end up with problem with more noisy high ISO. See 80D has more noise at high ISO than 70D due to more sensitive at low ISO for landscape it targets for to use shadow recovery. http://www.dpreview.com/reviews/image-comparison/fullscreen?attr18=lowlight&attr13_0=nikon_d5&attr13_1=sony_a7_ii&attr13_2=canon_eos6d&attr13_3=sony_a7sii&attr15_0=raw&attr15_1=raw&attr15_2=raw&attr15_3=raw&attr16_0=102400&attr16_1=25600&attr16_2=51200&attr16_3=102400&attr171_1=off&normalization=compare&widget=1&x=0&y=0 See how camera can cope or not cope with high ISO depends on noise floor. Also I added D500 as well for this one. D5 still beats D500 at ISO 102400. Anyway, It's so close in real world shooting it doesn't really matter. Given the choice between a slower processing of an in-focus photo, or a quicker processing of an out-of-focus photo, I'll take the slight hit on speed any day. The dinosaurs have had their day, off-sensor AF is no longer acceptable for people who actually care about accurate focus. ...except your mirrorless camera will be slower, and have fewer photos in focus. So, you're kind of screwed there, aren't you? Is the automated AF Fine Tune working fine with third part lenses? Yes, as long as it is a CPU lens. Just verified this with the Sigma 18-35 f/1.8. Excellent idea; all DSLR manufacturers must adopt this. However, it needs refinement to allow for multiple FLs, lenses, AF points and lighting conditions. I agree. This is a good step, but it doesn't solve AF problems on zoom lenses where different focal lengths and ranges result in completely different AF inconsistencies. Even then that is just a patch over an inherently inaccurate system. Focus accuracy will change with distance from the subject, AF point, and aperture. That's so much work and so many things to go wrong. Yeah, I borrowed a couple of lenses from a friend who was keen to sell them to me at a very reasonable price, but both lenses (Nikon 85mm f1.8D and Tamron 28-75 f2.8) don't play very well with my D750. The Nikkor is better behaved and generally works fine at f2.8 and smaller, but I'm primarily a low light shooter, and intend to use it at f2, since I already have the 80-200 f2.8. Unfortunately at f2 the focusing accuracy is really hit and miss in even moderately low light if the subject is backlit. As for the Tamron, I really fell in love with just how tiny and light the lens is, and when it's properly focused, it's actually pretty sharp. But that lens really doesn't play well with my D750, and even with AF fine tuning, I run into focusing inconsistencies at different zoom lengths and focal distances. I think you're confusing things, here. Optical phenomena such as residual spherical aberration (which relates to aperture) and others such as field curvature are lens-dependent and appear irrespective of the focusing method used to achieve focus. The question is whether focus-inaccuracies, that are an implication of the focusing method used, can be avoided. CADF can inherently avoid focusing problems that appear when (auto) focusing using PDAF; however, Nikon's method is very promising (not entirely there yet, but still very useful) in correcting PDAF focusing inaccuracies with very little effort; we should acknowledge that. Nikon dslr owners can be thankfully to Sony and other ML makers that they got now more accurate focus on they gears! Nikon does not want their high-end models to be worse in any aspect than entry-level mirrorless cameras. They have been catching up, and they are practically there! But well, you need to pay a high premium for these features on a DSLR. Sounds like more of a stopgap measure than an actual answer to the accuracy of on-sensor AF. That will always be an issue hounding DSLRs due to the mirror, and sample variations across lenses. I agree it sounds like a stopgap, but right now it seems like the best compromise available. It's certainly a lot better than shooting multiple test charts on a tripod and using software to determine which image is the sharpest at the pixel level, and how far it's front/back focusing. Judging from the comments on here, it sounds like it's finally okay for DSLR users who suffer from AF adjustment issues to come out of the closet. I've been praising Sigma for years for offering free lens-to-body calibration service, but many of my fellow DSLR shooters seem to believe that just proves that Sigma doesn't know how to build a properly calibrated lens in the first place. But since I've seen calibration vary from body to body I've owned, I know that at least half the problem is with the DSLR itself. It's just the nature of the beast, so it's nice to finally see it being discussed in the open by DSLR makers. Although they probably didn't have much choice since AF accuracy is one of the major advantages of mirrorless, and is part of the reason I've been transitioning. Someday we'll find our dusty old lens calibration charts in the back of closet and laugh. Canon has had lens ajustment in camera body for many years now. The problem with lenses and bodies are that they are within specs, but if you have a body and a lens that are opposite direction they will be off. So hence the user ajustment of af is a fine thing. You mean lens micro adjustment? All major brands offer AF adjustment as well. The main problem is they're a hugely trial and error process that involves shooting at lots of test charts from a tripod, so it simply isn't practical when out in the field. And unfortunately that's just how you'll break into a new lens (or a borrowed one), and find out that it's not playing well with your camera. Considering how good Canon's dual pixel live view AF is, you should theoretically be able to apply the focusing data as an offset when shooting in the OVF. The irony is, it was Nikon that first did this despite having a far inferior live view. Yeah, it seems like Oysso did not even read the article before responding to my comment. On the topic of Canon, I remember reading something a year or two ago about new high-end Canon bodies and lenses having some kind of new focus feedback loop capability to correct for these kinds of calibration problems on-the-fly. Is that still a thing? In the old D200 days there were tons of threads about focus accuracy. I don't think it was a taboo subject at all. Yes, the problem has been ignored for so long, and nobody ever wanted to face up to it. AF accuracy is 90% of the reason why I switched to a mirrorless system from my old pro Nikon kit. Night and day. Love this post. Case in point: If Nikon and Canon glass was perfect, then there would no need to use or have in body focus adjustment capability. The fact is, all the higher end camera bodies have this feature because manufacturing tolerances sometimes require micro focus adjustments. Sigma gets this. The Sigma USB Doc provides the kind of granular focus adjustments to make a good lens a super great lens. Many people describe certain lenses as being soft. Not really true.. they are simply not in focus. Backfocus in my own experience with Nikon DSLR cameras has been always the result of the camera's autofocus system selecting something behind the subject that provides greater contrast with a harder edge that is aligned so the single axis autofocus sensors can use them to compute when the lens is properly focused. The end result is perfect focus on something behind the primary subject and the new system while maybe easier to use will do nothing to address the key backfocus problems of the past. A few years ago, when I owned a Nikon D7000, I used the 16-85mm as my walk around lens. It front focused at FL under 28mm (by 4 units) and back focussed at FL above 70mm (also by 4 units). Does that sound like the AF system was grabbing onto something in the far background? Doesn't sound that way to me. Nikon's Rube Goldberg AF contrivance is no solution to such a problem, which occurs quite commonly among zoom lenses. The 16-85mm was no exception. However, once tuned properly, it was a very sharp lens, much like the 16-80mm lens that replaces it. This is one of the reasons I gave up on my Canon DSLR's...inconsistent AF. Mirrorless is the true solution here, everything else in DSLR land is a band-aid. Canon has lens ajustments. What cameras has not good AF on canon? Still DSLR is way faster AF than mirrorless. Not a way faster, not faster, about as fast, but better continuous focusing. At least on the price point of mirrorless (body-only <1500$/€/£). OTOH, DSLR's practicallly have no AF in video, no usable face detection, cannot choose the focus point ANYWHERE on the frame + freely adjust the size. OTOH x 2, 80D and so others can do this almost perfectly. ML has some advantages, as long as the light is bright, the subjects don't move too fast or god forbid if they move erratically. Try shooting basketball in a high school gym with crummy light with a mirrorless. We won't even discuss small birds in flight at high frame rates because it's hopeless for ML. I love it when they show how great ML can track "action" trying to focus on a bicycle being ridden sedately towards the camera. Try shooting dogs in an agility trial in a poorly lit arena a 10 fps with mirrorless. the thing is - only top of the line DSLRs are able to outperform new mirrorless cameras. The ones costing $1500+. Don't make it sound like every single photographer buys that kind of cameras and that every single photographer shoots mostly fast paced action photography in low light. Btw, I'm a DSLR user that mostly uses manual focus lenses. Hardly, A D7200 or an 80D will outperform ML easily. btw. im not talking about basic MLs. Nikon 1s, Sony 6300s and Fuji X Pro 2s are just as good or even better then 80D and D7200 in AF performance. talking form the first hand experience here as a DSLR shooter. Link me to one with ML shooting BIF or fast unpredictable action in poor lighting. Do you understand that neither D7200 not 80D can focus fast and accurately enough in those conditions? No personal experience with 80D but the D7200 did quite well in light down to -3 EV and would AF lenses at f/8. Which ML will do that. My D7200 did pretty well with my 70-200 f/2.8 at dusk on Egrets, Blue Herons, White Ibis and the like as long as I did my job. I can't imagine even trying that with a A6300 even I could manage the ergonomics of the Sony equiv on the camera. Low-light AF for ML is proportionally aligned to the lens' speed. My A7RII with FE 35/1.4 is equal to or better than my former D800E in low light. Well, that is if you can focus in time. I love my mirrorless, but I would take DSLR AF any day over them. Granted they are getting better. But wait, the DSLR guys always say PDAF is just as accurate as CDAF. Now their cameras are using CDAF to help with PDAF focus accuracy issues? Good to see Nikon finding a solution. I'm a DSLR guy and on behalf of all of us, we would never say that because generalizations don't apply anymore; technology moves too fast. The way it works is that for one cycle, Company A is ahead on several metrics, then the next cycle it's Company B. Then Company C comes up with something that blows them both out of the water, then it's back to Company A. Even more crazy making is that right now there is a kid in the optical engineering department at some university who is dreaming up a technology that will make these discussions moot. So, no real DSLR guys don't say anything. We just keep our eye glued to the viewfinder and shoot. its not a matter of contrast or phase detect, the problem is the autofocus sensor module beeing separated from the image sensor. thus a small miss-alignment of either thoose two sensors, the lens, the lens mount, or the mirrors will not yield tack sharp focus. This is probably obvious but I'll clarify anyway. PDAF with a separate sensor (much lower res than the main sensor) is optimized for AF speed, tracking, etc. Some day it should be possible to achieve both with one sensor but we aren't there yet. CDAF using primary sensor in a controlled environment where the scene has some obvious contrast points in it and speed isn't critical allows CDAF to act as the "known good" control point while removing the error due to alignment differences between the focus sensor and the image sensor. Personally I'm a camera guy (DSLR, ML, smartphone, etc.). I don't belong to a club that makes fun of other people who are in some other club. Will be there any firmware update in order to take advantages of this automated AF Fine Tune for models like D750, D810, D4S??? Is that possible? As much as I would like to see that implementation into my D750, I don't think it's possible to deliver it within a firmware update itself. While a firmware update can add in previously available features, the hardware needs to be able to execute the programming. Since the original camera designs never factored this feature, I doubt it can be done. Believe me, I want it, as such a feature would help tremendously in calibrating older lenses. You only need to write a program that focus on a subject with pdaf and then opens the mirror and do the same with cdaf. The hardware can do that for each dslr with cdaf by program. In theory it is a pretty simple process. I've always wondered why it wasn't implemented earlier (especially given how quickly and accurately Canon's Dual Pixel AF is). But the problem here isn't with the software, but getting the hardware to recognize the results from the live view focusing, and automatically applying it as AF fine tune offsets. Unless the image processor actually knows how to transfer the values from the CDAF system over to its PDAF module, the two will remain entirely separate and cannot communicate with each other. Some lenses, like the older Tamron 28-75 f2.8 cannot focus properly in live view on a Nikon system (the subject needs to be reasonably in-focus: if completely out of focus, it won't be able to lock on, and either way, focusing accuracy is completely hit or miss). Essentially, if the hardware can't support it, a firmware update won't help. Are you really sure that the pdaf readout is not shared with the main processing system ? But you must be right, I was wondering for years that automatic af fine tune was not implemented in dslr. It's a shame that those futures are only implemented by Nikon or canon now as the mirrorless gets more market shares and becomes a real alternative to dslrs. I honestly can't be 100% sure, but it would explain why the Tamron lens I mentioned almost can't focus in live view, as it's a pretty old lens design that was designed when live view on DSLRs were still in its infancy. They also depend on lenses. I noticed my screw-drive lenses don't focus as quickly or accurately in live view, but with the OVF, they're pretty fast. Also, my Sigma lenses for my Sony a6000 are CDAF only: the PDAF points don't work on it. The image processing sensor needs to be able to translate the CDAF information from the live view focusing into the PDAF module. It's in theory very simple to program, but the hardware architecture needs to be able to support such a feature in the first place. I though that in modern systems all subsystems where communicating whit the main system. You do only need a one wire (or two) bus for that. Nikon: "Eureka! We have discovered a better way to burn fuel by compressing it with a gigantic compressor, then squeezing it into the combustion chambers via a gigantic pump, instead of the aspirated carburetor! Voila!" Customers: "But, but... Nikon, FUEL INJECTION has been the way since decades ago!" Well, carbs were the norm until fuel injection. Nikon: ML cameras don't have this problem. We still do, but we're working on it. I loved my Nikons, but ML is the future, and the future is now. I love my Sony a6000, but there's 2 main reasons I'm still using a DSLR for my work shoots. 1) Battery life. Even with a spare battery, my Sony still doesn't have the endurance of my D750 with a single battery. 2) OVF. Until hybrid viewfinders become commonplace and not just strictly the domain of Fuji premium cameras, there will still be the need of DSLRs for OVF shooting. Don't get me wrong, I love electronic viewfinders, but they're not meant for more than 2-3 hours of heavy shooting at most. If you have an all-day shoot, the strain on your eyes looking into an EVF is tremendous, and can lead to migraines and dizziness. Unfortunately I get the distinct feeling that manufacturers don't really want to work with OVF anymore if it's not a DSLR. Even external OVFs for cameras like the Fuji X70 are frighteningly expensive. as with almost everything - basic stuff costs are reasonable. extras are prohibitively expensive. at first, when i was buying a digital camera i wanted to get a rangefinder... but gasp! even used RD-1s more expensive than new DSLRs. Heck, I didn't even know Epson managed to digitize a rangefinder camera. I would really love a digital back for my Nikon FM2 actually. To be honest, I quite like EVFs for my street shooting, or when travelling. EVFs have improved a lot in recent years. As long as it's not in very dim lighting, or shooting something moving very quickly, the viewfinder should be able to keep up. Granted, they do make you lazy since you know exactly how your shot is exposed before you snap the shutter, but I don't think that's necessarily a bad thing as you learn to open up your options when shooting over/underexposed. I like Fuji's hybrid viewfinder approach, as I feel both OVF and EVF can go hand-in-hand. So I'm rather disappointed that other manufacturers hadn't bothered trying to take that exclusivity away from Fuji. They may be the future, but they're not quite there yet for certain applications. Trying to understand "In this case, for this lens paired to this body, automated AF Fine Tune found a value of +14 was best. This indicates that for correct focus, the camera has to shift focus backward an arbitrary 14 units from the focus reading the phase-detect sensor makes." ===> If the focus is auto, how does it get wrong in the first place? Any auto system .. I thought moves the lens back and forth so that image is in full contrast or two images coincide.. so why should it error? exactly. mirrorless uses the same sensor for taking images and for AF, thus there can't be any misalignments. You can already do this with your DSLR, too. It's called Live View. Not as fast, but every bit as accurate as the mirrorless cameras. And I presume that eventually Live View focusing will be just as fast when the technology is put into the DSLR sensors. I, personally, rarely use it, as both my D810 and D750 are spot-on, with little tuning necessary. And EVF's are not the same (or as good) as seeing the real thing, IMO. @Westerner, there's a difference between using a good EVF and live view though. I prefer having an OVF, but failing that, I require having an EVF at the least instead of composing all my shots via the LCD. Nikon's live view focusing still has a long way to go unfortunately. Prior to my current D750, I was using a Canon 70D, and the live view for that was astonishingly fast and accurate. It's very nearly on par with a mirrorless CDAF system. The only problem is, it burns through the batteries like nobody's business, and of course, it's highly intrusive to people around you. The live view on my D750 is embarrassingly bad in comparison. It's somewhat inaccurate with screw-drive lenses (you need G lenses), slow at best in good lighting (about 1-2 seconds), and all but unusable in dim lighting conditions. The 70D's live view on the other hand, is what I fall back on when the PDAF system can't lock-on due to poor contrast/lighting of subjects. That being said, +14 is a pretty bad error margin. So it's just the same adjustment principle like on my D300, but only automated? Why would you have 24 MP* on a APS-sized sensor when the autofocus already has real problems with 12 MP? *: or 17 like on a D800 in APS mode. Not for candid shots, not for anything moving, and definitely not if you're focusing using your optical viewfinder. Perhaps among you children who have never known a world without autofocus, but if you use the same set of manual focus lenses for a while you get a very precise calibration between your eye and your focusing hand. The problem with autofocus is that it can't read the photographer's mind, it will focus on eyelashes instead of pupils or the wrong part of the pork chop on a plate. Luckily computers still can't do nuance or we'd all be out of job. When you start a post with an insult -there's no point in finishing. Also, power-steering is for p*#$ies. And BTW, get off my lawn you damn kids. No. As long as you have full time manual override on most canon lenses, you can just fix focus manually if you want at any time. Thats the craziest statement ever. I'm *very* skeptical anybody can quickly and precisely manually focus a 30 MP or higher camera through the OVF alone. Maybe "good enough" to view scaled down on a website, but certainly not good enough for a large print. @smilergrogan; jeez I'm an old geezer and although I know your intent, it sure seems like you aren't capable of using AF with spot mode nor have you used a very fast prime (like the 85mm f1.2). If you were talking landscapes, still life, etc. okay MAYBE...but us youngsters are likely getting sharper images with faster lenses with moving subjects at hand-held than you are. And, as they point out, it's still only for "certain shooting distances." Just fail. Automated AF adjustment for high resolution sensors has been way overdue for years now. This firmware option should have premiered in 2012 with the launch of the D800 with it's woeful left AF focus issues. The fact that this is launching in 2016 with only support for calibrating the center AF point under one type of lighting should be an embarrassment for Nikon. When this can be automated for all AF points at all zoom positions under multiple light sources, it'll be a worthwhile upgrade. Until then let's call this very minor improvement to DSLR focusing tech what it really is... a half-baked step in the right direction. Underwhelmed. Totally agree. They need to step it up a whole lot more! Also I don't see why it should stop at one value. As the writer says canon has adjustment for the near and far end of the zoom. But why stop there? In 2016, the software should be able to take a prime lens, say a 50mm, and automatically do x3 shots near mid and far and choose values for each. Why should be be using x40 to get a "best fit" value for sharpness for subjects across different distances? Is nikon suggesting that my said 50mm lens can only really be used at one subject distance to get best sharpness, the moment I change that up I have to refine tune to that distance. That is what I have always found odd and sloppy about the AF fine tune on cameras. I always noticed if i calibrated to close distance when I took shots of people far away the system missed those. Come on, what a joke! +1. Think about it, primeshooter... AF adjustment is purely an offset value stored in a data table within camera memory. With flash memory as big and inexpensive as it has become today it's a crime that Nikon created this algorithm to only handle one offset value per lens. There isn't a technical limitation to overcome here. Nikon is simply too lazy to write the program code for storing more values. That's why I'm tough on them regards AF adjustment and wish DPR would follow suit. We strongly suggested they allow for the calibration of all points, just to deal with those very instances like the D800 left AF issue. Furthermore, different lenses can behave different with different AF points: meaning, one lens can focus well both centrally and peripherally, whereas another lens focuses well centrally but not peripherally. Calibrating all points would deal with this issue. Of course, it'd be cumbersome, but they could probably ask that you frame a brick wall or large chart, then have the camera do everything itself, jumping from point to point, taking 3 samples to ensure that no one sample is an outlier. Essentially, they should probably just work with a company like Reikan (makers of FoCal) to just get this right. fPrime from the sound of it I think you do not clearly understand the problem and probably have never written code. I am shooting with the D5 and my reason for the upgrading from the D4 was ISO and Frames per Second. I am not willing to give up FPS to maybe have possibly a sharper image. To put in simple terms. Camera to Lens "Where are you." Lens "I am here at XYZ" Camera to Lens "OK now let me look that up before we snap it." With one number it is imbedded with several you are doing a comparison before each time you fire. The problem is not as simple you make it sound. This is a nice feature, but I hope Nikon doesn't slip up with another critical determinant of AF performance -- mirror alignment. There was evidence at least from my point of view of this problem creeping in all through the 2000s, and it affected both my D7000 bodies and judging by forum posts, tens of thousands if not even six figures overall. The most depressing manifestation of this was my D200 clearly backfocusing under incandescent compared to normal focusing under sunlight, while a Fuji S5 Pro (for newbies, this was camera with Fuji imaging sensor and processing but Nikon D200 kit for everything else) I rented was spot-on perfect. What does mirror alignment has to do with focus under different light. Incandescent is more yellow, so you will get a different focus than sunlight. Think that is just physics of the lens rather than any alignment. Put on an UV/IR cutoff filter. Problem solved. Deliverator, a great deal. Phase detect AF uses a beam splitter that splits the light up by wavelength--and wavelength is related to color temperature. This has the practical result of making correct AF on a miscalibrated system (i.e. one where part of the AF optical system, e.g. mirror, beam splitter, etc. is out of line, causing light to pass through the beamsplitter at the wrong angle) possible only at one color temperature and systemically results in frontfocus on one side of that temperature and backfocus on the other. I learned in the process of dealing with this that Nikon only tests at one point. Two are necessary to catch out errors. The fact my responder got a rating and I did not (as of the time of writing this post)? Well, that demonstrates, if nothing else, lack of awareness as to how phase-detect autofocus actually works. People instinctively get contrast detect AF, the type mirrorless cameras use. Phase-detect is a different beast. wombat asked the question. I suggested using the UV/IR cut filter. I always check if my lenses are properly micro-adjusted by doing something similar by hand. Use contrast focus ... switch to phase focus and see if it refocuses (or other way around). Changing micro-adjust until it is OK.
Automating this is great but there really should be some sort of memory to store various levels of compensation for different distances and light temperatures for each lens (or focal length in case of zooms). I hope other camera companies will adopt this as well!! Thanks Nikon for starting it!! in 2016 this should be possible. Im sure you will see plenty of pro photographers shooting the upcoming olympics with mirrorless. Im sure you will see plenty of pro cinematographers shooting movies with mirrors in their equipment. We are not that many years away from mirrors being left in the dust. PS I own and shoot Canon DSLRs. I get your point, but we are still not there yet, and right now dslr are still ahead as far as AF goes, again, try shooting indoor sports with a 600 F4 on a mirroless, good luck with that. Why should the majority of photographers care about what camera is used at the olympics? Shooting a 600mm indoors is a very specialized application and for most users there are better cameras than a D5. I use a Nikon D300 (and D500 soon) and a Fujifilm X-T1. Mirrorless cameras are slow to operate. Sure they can shoot fast but you can not shoot what you can not see fast enough from the viewfinder. You can not compare optical viewfinder to a digital one. Any dSLR is faster to react than a mirrorless. Mirrorless is great if you have time for general photography. @ Erciro. I'm not sure the Fujifilm X-T1 would be the fastest autofocussing camera to judge all 'mirrorless' cameras by. There are faster ones. @Ross the Fiddler. I am not talking about just the AF speed. Turning on, seeing and aiming through the viewfinder. All that process is a lot faster with dSLRs. There is simply no delay. @joe, but this is not about most users, this is a thread about the Nikon D5. Shooting a 600mm indoor might be a specialized application, and this is exaclty the type of application that dslr shine, and wich the D series are made for. I have nothing again mirrorless, I shoot nikon and Id like to add an a7r2 for "slower" type of work, like portraits, but I dont understand whats up with all these dslr thread sh***ter, laughing at that "old and soon replaced" tech, in THE situation (sports, because remember that this is a sport camera) where it clearly smokes the mirrorless. Yep, DLSR is just snappier and more reliable. The best range of lenses is still from DSLR line. I guess that for working SPORTs shooters, this reliability, speed and support are more important than focus peaking, exposure preview and size. Also, MILC has not yet fully advanced to some important (yet simple) features such as double cards and better batteries. But for any other work, I don't think you can go wrong either way. Today I see more value in MILC for video work, but other than that It's a mixed bag of advantages/disadvantages, depending on what you value most. Anyway, I believe that DSLR system is going to fade. There's so much potential in sensor based focus and viewfiender IMO. And don't forget battery power, and how mirrorless simply cannot compete against DSLRs. It's pathetic. True, most people don't need a D5. But there is no ML that can approach what a D5 can do. Name any ML that can AF at -4 EV. Even -3 EV. If you shoot sports or wildlife for a living, by all means get a D5. It's just not the king of all cameras any more. Ross, no but I do photograph BIF in early morning and late evening. I also photograph wildlife just after dawn and after sunset that ML would never lock on. Thanks Culture Vulture. 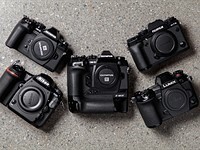 Which mirrorless camera are you referring to (I assume you were using it)? Also, with what lens? Ross, Sony A 7sII with the 70-200 f/2.8. It belongs to a friend who loves it for it's high ISO image quality. Which is very good. He is not impressed with the AF tracking in low light. The A7S II has CDAF only and the 70-200/2.8 must be an adapted lens. This can't work properly for tracking at all. A7 II, A7R II or A6300 will be a world better for tracking! How does a teleconverter affect this? I saw in the video a value of +14. Is it still a range of +20 to -20? If so, what happens if the calibration value can't fall in this range? The lens needs to be repaired. Same question as mine ... I guess is the clou of Auto fine tunning. What about third-part lenses: the method work the same? That's really useful! I have the D800E and I will upgrade in the future with the D900, this is a really big step forward for the street portraits were the focus speed and precision is fundamental (you can't capture again the same scene/subject). This is not a "pro" level feature; it is something that should be available on all DSLRs. 99% of consumer users of dslr cameras neither shoot raw nor do they use fast primes and generally won't bother to adjust their AF on their kit lens. I'm sure the D760 probably and the D820 (or D850?!?!) certainly will offer this automation feature. @photominion what does does RAW vs. JPEG have to do with focus precision? If a photo is not properly focussed, it will be seen in a JPEG just as well as in a RAW. Valid point. However, RAW-shooters have a higher tendency for pixel peeping, where a slight front/back-focus will become obvious with slower lenses. Also, if you only use jpg files to view on smartphones/tablets, you will never realise if the focus was ever so slightly off..
2) regarding the mirror, I like to see what I shoot with natural colours. I am not convinced by electronic viewers. A traditional viewer or a mirror does this job. Your flicker system would cause the eye to receive half the perceived brightness. This is a problem faced by 3D cinema projectors, which alternate between the left and right images. Many cinemas use twin projectors for 3D to compensate. Others use a single projector with an extra bright light source. Until you figure out how to do that with a live scene in front of a camera, the idea is bust. Interesting idea, but the metering sensor (in the pentaprism housing) might suffer from receiving less averaged light. It might even cause eye strain and other side effects due to low frequency, it would need to be a lot higher and with fade in/out oscillating curve to avoid hard on/off flickering that many people have problems with. The mentioned 60fps frequency is to be tested. But I know that 25fps is some kind of minimum for movies. Remember the trick of inserting a "special" frame every 25 frames : nobody would see this frame. Of course the mirror does not move, the surface of the mirrot might be made of liquid cristals or somthing like that. The drawback is some cabling that would move with the mirror. This might be the real weakness of this solution. 24 fps is a legacy of analogue film. It relies on long shutter speeds and motion blur to reserve an illusion of continuity. In fast action sequences with short shutter speeds, 24 fps is all but unwatchable. The standard has survived solely due to a desire to imitate the "Hollywood look". Hollywood is moving on though. Films (i.e. the Hobbit) are beginning to be produced in 48 fps, particularly for 3D where half the frame are dropped for each eye. Circling back to the topic of mirrors in cameras: this was never about what fps the mirror would switch at. This is about the percentage of time light would be allowed through to the eye. There's no getting around the fact that either the light goes to the eye, or to the focusing sensor, but not both at the same time. What results is inadequate light for both. Mirrors in cameras are a technological dead end. On-sensor focus and mirrorless is the future. Light flickering is different to video fps, video fps is a motion perceptual thing, light/source flickering is a physical thing and it can cause serious eye strain and headache. Think of it as a stroboscope, it's frequency needs to be a lot higher than 60hz and it must have a falloff-burnout curve switching rather than hard on/off. I'm usually critical of pricing, but considering what the D7200 goes for, I'd concede that at $2,000 (and likely to go down), the D500 is an attractive proposition. 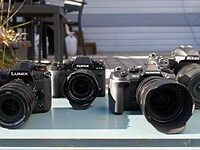 Too bad Nikon is slow in many areas, but no doubt the higher end DSLRs are exceptional cameras. I want one but will wait till the price drops a bit. It will be a HUGE upgrade from my D300 and in many ways over my D800 as well. If i like it enough, if the AF is accurate and fast enough, and if the IQ is good enough for apsc, i may sell my D800 even. Looks to be a monster, probably the best apsc camera to date. @Max Iso I don't know what you're shooting, but I know that the D800 and the D500 are vastly different cameras. Given that the D800 is old-ish already and that the two sensors have around the same pixel density, I'd bet that the D500 gets you the same or better picture if looking pixel by pixel. But other than that, how would a D500 replace a D800? Im glad you asked. I shoot a little of everything, but mostly portraits. Thus, DOF control is important but so is AF as i tend to shoot what i call "real time portraits", shots that are not poses. For example the shot in B&W of my daughter running towards the camera in my gallery. This is also why AF is so important, shallow DOF with motion isn't something lesser cameras do well. Now if you look at top lenses, money notwithstanding, FF has more DOF control, but apsc can use shorter/faster lenses and get good DOF control for portraits. IQ is less an issue with my kind of shots as well. Love my D800 but with superior AF, auto calibration, longer battery life, and a body that can also use my 18-140, i will likely find it an easy replacement of my D800. I also think the new Sigma 50-100 f1.8 is nearly a FF replacement in about everything i shoot. A D500 and that Sigma would be a very powerful combo for me. Not bad, but is this the full truth?! Is the PD AF now compensated in regards of light temperature? With my D4 it is not. Simply do a test using a D4, 85 1.4G and the AF illuminator of a SB910 for example. This lens tuned to "daylight" is way off when using the SB910 AF illuminator. There were many talks about issues regaring AF accuracy using PD AF cameras under different lightning. When I look at the latest samples here using the D5 with 35 1.4G I can´t ignore that some pictures are still OOF, even with this masterpiece of AF system. Try a UV/IR cut filter. I don't think that's true, but i do think you hope it's true. Many people on here get a lot of joy at the idea of DSLR users being unhappy. They all have room to improve, but after using both formats multiple times, im far happier with Canikon. Why do all of your posts have emotes or lol in them? Is this really humorous or are you not all there? Dude, stay in your mom's basement unless she's done making dinner. Thought you knew that already. I'm surprised that such feature wasn't developed earlier. Much earlier. I'm looking at you, Olympus, the self-proclaimed innovator. I've been wondering for a long time why DSLRs couldn't auto-tune AF by some comparison with the actual sensor image. Sending the kit to the service for AF tuning can be troublesome and unreliable. Well, at least they finally did it. @love_them_all: I mentioned Olympus because back when this feature should have been introduced they still made DSLRs, and they made the first DSLRs with live view. As for the amount of coding, I wouldn't bet on it. I do software for a living so I should know. What looks simple on the outside isn't necessarily so behind the scenes. Give Olympus a break. They first started using AF Fine Adjust in the E30 (& I think the E620 too), then of the course the E-5 & now the E-M1 where it is useful for adapted 4/3's lenses & also used in C-AF of their native M4/3's lenses. This new tech idea may be another nice addition for the E-M1 Mk II, but getting back to Olympus innovating, the others had to catch up to them with Live View in their DSLRs. This new feature is essentially an automated version of horschack's clever Dot-Tune procedure. I'm wondering how sensitive the results are to the shape of the actual fine tuning curve of a given lens. If the curve has the ideal bell shape, the result will probably be very accurate. But not every lens has the ideal shape. The tuning curves of some lenses can be very asymmetric. The tuning curve of my Nikon 70-200mm f/2.8, for example, based on the results of tests I made with both the Focal and FocusTune software on my D800 camera, was nearly flat across a large range of micro adjustment values. In other words, this lens was capable of producing sharp images almost regardless of the tuning value I chose to dial in, which of course is GOOD, not BAD. Asymetric AF-FT is more likely an artifact due to poor testing technique and/or poor software. Did you test you 70-200mm in the field wwith different AF-FT settings? I've tried Dot-Tune, but it is not very sensitive, and "confirms focus" over quite a wide range. I have a better method based on an interference technique. @Lynniepad: "Did you test you 70-200mm in the field wwith different AF-FT settings?" Since I do a lot of landscape photography, none of the standard tuning techniques works for me. I need to fine tune the camera to focus "at infinity," not at 5 m or 10 m. To calibrate my lenses I go out in the field and take a series of shots with different micro adjustment values and then I choose the sharpest one of the bunch. Utility poles are useful for that purpose, given all the electrical cables and circuit breakers and insulators and bolts you can find on them. It works for me. Over the years I've examined and evaluated more than a million images; by now I think I can tell, at least to some degree of satisfaction, when an image is in sharp focus and when it is not. As so many others have posted here, the DSLR autofocus setup is archaic. It's a scheme no engineer worth his salt would design today if he were tasked to create an AF system from scratch. I'm sure that you know what you are doing. I found that "a series of shots and picking the best one" is the only foolproof and reliable technique. I often check the AF-FT before an important shoot, and lately, I've been using a Moire/Interference technique for a quick confirmation. (frame a specific target and Moire says "OK"). Can be used at any distance. Strangely enough, my first AF-FT test was of a utility pole and associated gear just across the road. It's a relief not to have to worry about such AF issues with my Sonys. @LynniePad: "I've tried Dot-Tune, but it is not very sensitive, and confirms focus over quite a wide range." I agree with this comment. In fact, the procedure does not work at all for my 80-400mm VR II on my D7200. Thom Hogan, IIRC, reported a similar issue with his 80-400mm lens. And that is why in my earlier post I raised the question of how well Nikon's implementation might work on various lenses. We will soon know the answer as more people get the D500 in their hands and do all sorts of tests. Nikon must not have felt threatened by mirrorless until now, eh? And Canon must still not. Since they are conceding this minor weakness, they should go all the way and add a split focusing screen in the OVF. I would really appreciate it. (just as an example for a D800)... but they are available if you want one... not from Nikon though. If only DSLRs had apps, this could be done easily in software to fine tune a lens to body. The app could guide the process with prompts and save the settings directly into the camera. It would work as simply racking through the different focal lengths in a zoom and having targets at different distances. Start at the wide end, focus on minimum distance. Camera would be in phase detect, get focus. Switch over to sensor detect get focus, calculate difference. Save setting in camera database. Next would be to move target further away, repeat the process until you get to infinity, then move to the next focal length. It would be a tedious process but if you wanted ultimate accuracy these settings need to be done. Each zoom lens could have fine tuning for up to 5 focal lengths and 5 distances. 25 checks, can be possibly done in 1 to 2 hours. But I doubt they will make this available to older cameras. The "computer" potential of our modern cameras has clearly never been realized. There's been starts with the WiFi and other networking features, but disappointing overall. what do you want? a camera that runs tetris? I want a solid performing CAMERA... if I need a fully fledged computer I use my computer. You can play Tetris on a Canon with CHDK: http://chdk.wikia.com/wiki/Features. It'd be nice if the major manufacturers provided a firmware SDK so projects like this wouldn't have to resort to reverse engineering. Still a kludge of an approach since distance matters a lot with many lenses. Also, what about manual focus lenses that have CPUs where you want to use the green dot in the viewfinder to confirm accurate focus - that indicator needs major upgrades to really be useful. Also, could this not be added to older models via a firmware upgrade? Doubt that will happen. As long as the camera has CDAF in live view. 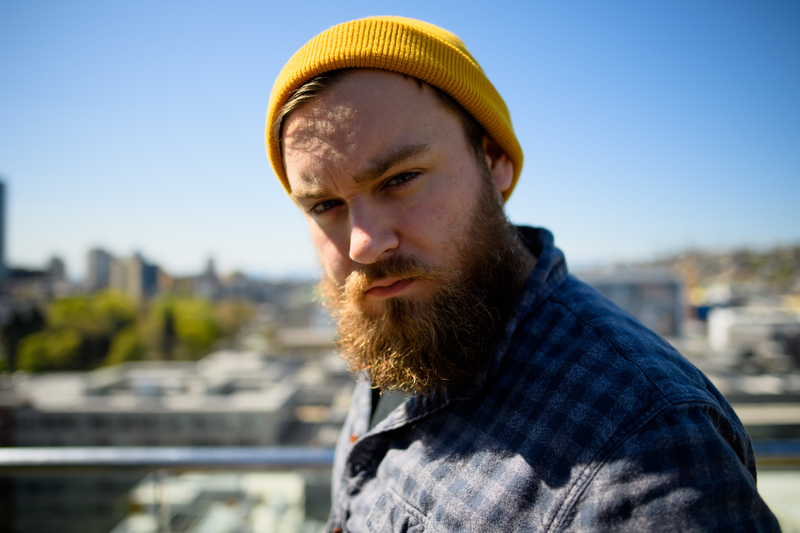 @jhinkey: "Still a kludge of an approach since distance matters a lot with many lenses." Don't forget the proper tuning can also depend on the internal temperature of the camera. If your camera is out in the hot tropical sun all day, or if you are shooting in the cold Arctic or Antarctic, the optimal tuning values may be quite different. Yep to the above. On-sensor PDAF is the future such that many of the inaccuracies in lens focusing can be gotten rid of. On-sensor PDAF has its own issues, but these are becoming less and less as the technology improves. AF calibration: this is the very reason I switched to mirrorless about 3 years ago. I'm so glad I did. Mirrorless users love to overstate this problem. If you do the calibration at the recommended distance, you've got excellent AF over nearly all of the distance range, from a few feet to infinity. The only exception, if any, is going to be the very closest distance range. Just stop down when doing extreme closeups. Problem solved. Nikon's method is a quick way to calibrate the AF to be the same as AF on the sensor. DSLRs will always focus at the widest aperture of the lens, whereas mirrorless cameras focus at the taking aperture, which is not going to be the optimal way to focus if you stop down. @yake I don't think mirrorless focus at 'taking' aperture. Yes, there is this new lower end 50mm f1.8 for sony FE where they made this, apparently not good, decision to focus at 'taking' aperture, crippling low light AF but I don't know about any other examples. You think Nikon created this kludge merely because "Mirrorless users love to overstate this problem"? 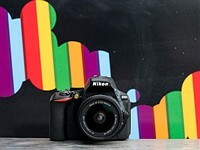 @ Eric Hensel, Nikon created a very efficient way to refine their already great products, without going down the path of mirrorless and all of its associated problems, such as the poor EVF experience in low light and contrasty light and poor battery life. Nikon isn't responding to mirrorless users, but rather making the AF calibration they've offered for years significantly easier. It's a predictable and sensible advancement, whether mirrorless existed or not. "poor EVF experience in low light and contrasty light and poor battery life." Both complete non-issues in my experience. "It's a predictable and sensible advancement"... It is a kludge. Well, our experience is different then. Those are real issues in my experience. I've spent a lot of money on mirrorless cameras and found them to be just ok for personal use but very problematic for work. Nikon and Canon provide much more refined and robust systems for work. I've had a lot of lenses over the years and only two with focusing issues. Those issues were easily corrected with AF fine tune. I think the issue is very overrated and not enough to be a major factor when choosing systems. Mirrorless AF is guff, in 2015, 2016...A DSLR (pro level) easily outshines mirrorless AF even if I don't calibrate it. So let's nip that one in the bud pal. @ Yake. "DSLRs will always focus at the widest aperture of the lens, whereas mirrorless cameras focus at the taking aperture, which is not going to be the optimal way to focus if you stop down." I don't know know where you got that one from. ??? Generally the AF is taken wide open, however the aperture might close to an optimum amount in bright lenses to suit the sensor's sensitivity & to be able to display the Live View without showing a washed out screen. That's just roughly the general idea anyhow (I have done the nerd thing & looked at the lens front end during focussing & exposure to see for myself what occurs). It never ceases to amaze me how technically complex photography can be. This is a very helpful feature, and I hope it trickles down to lesser Nikons and eventually includes more than one point for zooms. At the same time, It’s discouraging that the potential for this kind of misalignment still exists at all. It's also interesting, one can test if a lens/camera is actually focusing differently at differing distances as well. If the AFFT value changes based on distance, the answer is yes. This would (will when i get a D500) be the first thing i check for on any lens. This may also help others with lens purchases with bodies without Auto AFFT, so they know which lenses are prone to distance variation (assuming it's a lens issue alone).